Map of the United States District Courts in Virginia, showing the boundaries of the Eastern and Western Districts, and their divisions. The United States District Court for the Western District of Virginia (in case citations, W.D. Va.) is a United States district court. Appeals from the Western District of Virginia are taken to the United States Court of Appeals for the Fourth Circuit (except for patent claims and claims against the U.S. government under the Tucker Act, which are appealed to the Federal Circuit). 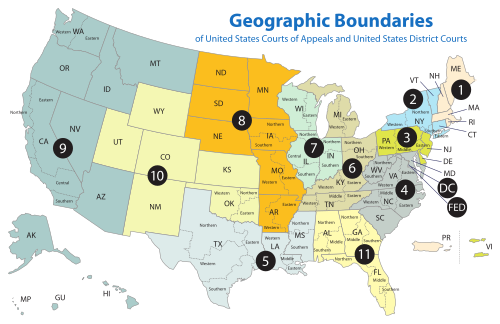 The court is seated at multiple locations in Virginia: Abingdon, Big Stone Gap, Charlottesville, Danville, Harrisonburg, Lynchburg and Roanoke. The Western District of Virginia covers the counties of Albemarle, Alleghany, Amherst, Appomattox, Augusta, Bath, Bedford, Bland, Botetourt, Buchanan, Buckingham, Campbell, Carroll, Charlotte, Clarke, Craig, Culpeper, Cumberland, Dickenson, Floyd, Fluvanna, Franklin, Frederick, Giles, Grayson, Greene, Halifax, Henry, Highland, Lee, Louisa, Madison, Montgomery, Nelson, Orange, Page, Patrick, Pittsylvania, Pulaski, Rappahannock, Roanoke, Rockbridge, Rockingham, Russell, Scott, Shenandoah, Smyth, Tazewell, Warren, Washington, Wise, and Wythe; and the independent cities of Bedford, Bristol, Buena Vista, Charlottesville, Covington, Danville, Galax, Harrisonburg, Lexington, Lynchburg, Martinsville, Norton, Radford, Roanoke, Salem, Staunton, Waynesboro, and Winchester. 6 John Jay Jackson Jr. VA 1824–1907 1861–1864 — — Lincoln reassignment to D. W.Va.
12 Armistead Mason Dobie VA 1881–1962 1939–1940 — — F. Roosevelt appointment to 4th Cir. 17 Hiram Emory Widener Jr. VA 1923–2007 1969–1972 1971–1972 — Nixon appointment to 4th Cir. The U.S. Attorney for the Western District of Virginia represents the federal government in the court. The current United States Attorney is Thomas T. Cullen. The current [update] U.S. Marshal for the Western District of Virginia is Wayne Pike. ^ a b Asbury Dickens, A Synoptical Index to the Laws and Treaties of the United States of America (1852), p. 388. ^ a b c d e f U.S. District Courts of Virginia, Legislative history, Federal Judicial Center. ^ Recess appointment; formally nominated on January 29, 1840, confirmed by the United States Senate on February 17, 1840, and received commission on February 17, 1840. ^ Recess appointment; formally nominated on January 11, 1940, confirmed by the United States Senate on February 1, 1940, and received commission on February 5, 1940. Federal Judicial Center Website - Judges of the W.D. Va.